Breaking bread on Shabbat after returning to Boston. YESUD HAMA’ALA, Israel — For thousands of years, Jews have searched for a way back to this sacred land. And for an even longer time, they’ve also been encouraged to marry other members of the so-called tribe. “It’s not a minus one, it’s a plus one,” he tells 21 young Boston couples awaiting sunset in the country’s lush northern mountains. Minutes later, a buoyant party kicks off in a nearby tent, replete with grilled lamb and live music. Drinks were raised, chairs were lifted. It was like a wedding reception, although most of us on this trip were already married. That was the point. Many Americans are familiar with Birthright Israel, a free educational trip to the country available to young adults with Jewish heritage. But an increasing number of US Jews are marrying someone of another religion. According to the 2015 Greater Boston Jewish Community Study, a decennial survey of the region’s Jews, 47 percent of married couples are interfaith. That share is even higher nationwide. Enter Honeymoon Israel: a heavily subsidized, immersive trip for couples, many of whom are interfaith, with the aim of cultivating intentional and meaningful communities on their own terms. 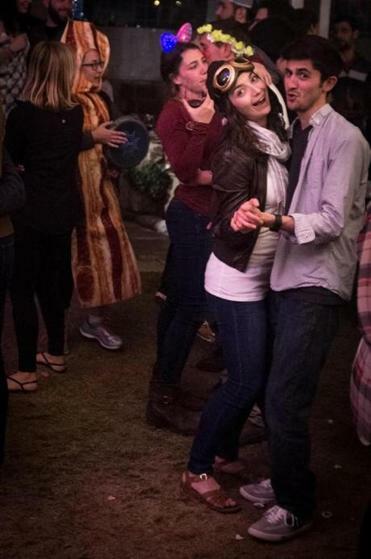 Costumed Honeymoon Israel participants dance at a Purim party. Eligible couples must be within the first five years of marriage or in a committed relationship. At least one of the partners must be between 25 and 40, have some Jewish heritage, and not been on an organized trip to Israel, such as Birthright. We joined Boston’s first trip, and HMI’s 32nd overall, in March with 20 other couples who live across the Greater Boston area, from the North End and Southie to Newton. Our proximity was intentional: for building community and maintaining friendships, Rubel said, it’s imperative that couples are geographically close. An upcoming September trip mostly includes participants from north of the city. Applications are open through mid-July for two 2018 trips, departing in January and March. The tour itself was organized thoughtfully, and with precision. In my dozen or so trips to see family in Israel, I’ve never seen this much of the country, or experienced such a wide swath of the culture. On a single day, we awoke in Jerusalem, climbed Masada, King Herod’s mesa fortress in the desert, bathed in the Dead Sea, and drank local wine while watching the sun set over the Sea of Galilee. We spent the next few days winding our way through the north, including a tour of the Syrian border, where we were close enough to hear explosions from the civil war. In addition to seeing the country’s best-known landmarks, such as Jerusalem’s Old City and the Western Wall, there were off-the-path presentations, such as a visit to a Hand in Hand School, which teaches Jewish and Arab students side by side — in both Arabic and Hebrew. 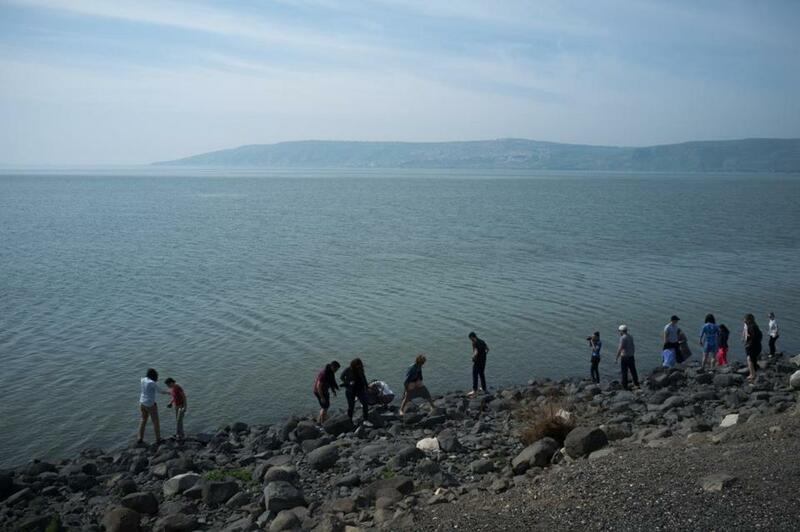 Participants dip their toes in the Galilee at Kfar Nahum (Capernaum). We ended our tour in Tel Aviv, staying at a chic beachside hotel that rivaled (OK, exceeded) any of the places where my husband and I stayed on our original honeymoon in Spain. Organized conversations about faith and Israel were sprinkled throughout the trip, conducted by a rabbi from Temple Israel of Boston and a staff member for Combined Jewish Philanthropies, HMI’s local partner and one of the region’s largest nonprofits. There were relaxed Shabbat and Havdalah services to mark the beginning and end of the Sabbath (including a particularly memorable one on the hotel rooftop overlooking the Mediterranean sunset). In the most religion-forward portion of the trip, Avraham Infeld, a Jewish educator and former international president of Hillel gave a forceful two-part lecture about religious identity that pushed me — a cultural Jew — beyond my comfort zone. Still, Rubel says, HMI’s goal is not to convert couples or convince them to raise Jewish children — quite the opposite. 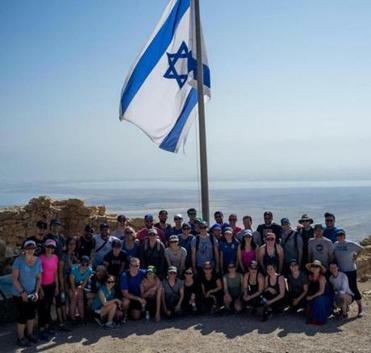 A group photo atop Masada, overlooking the Dead Sea and Jordan. HMI does send a “Made in Israel” onesie to HMI alumni who become new parents. For all this, we paid $1,800 for two, including flights and most meals, over 10 days. HMI advertises the actual cost of the trip as being about $10,000 per couple. Much of the trip experience depends on the other couples. It takes a special pair to sign up to travel with 20 other duos in the desert for 10 days. For HMI’s part, organizers say they select trip participants to match the local community as much as possible. On average, Rubel said, about 60 percent of participating couples are interfaith. (I’m the product of an interfaith marriage, and my husband, after spending much of his youth in evangelical Christianity, left the church and now considers himself Jew-curious.) Of the other 40 percent, about half of them have a partner who is Jewish by choice and the others are born Jewish, he said. When we departed Logan International Airport for Tel Aviv, all but two couples were engaged or married. One proposal came at sunset overlooking the Sea of Galilee. We celebrated, nearly every night, for the rest of the trip. A few months later, after we had settled into a pattern of Friday evening Shabbat dinners with our new friends, the other couple announced their engagement. 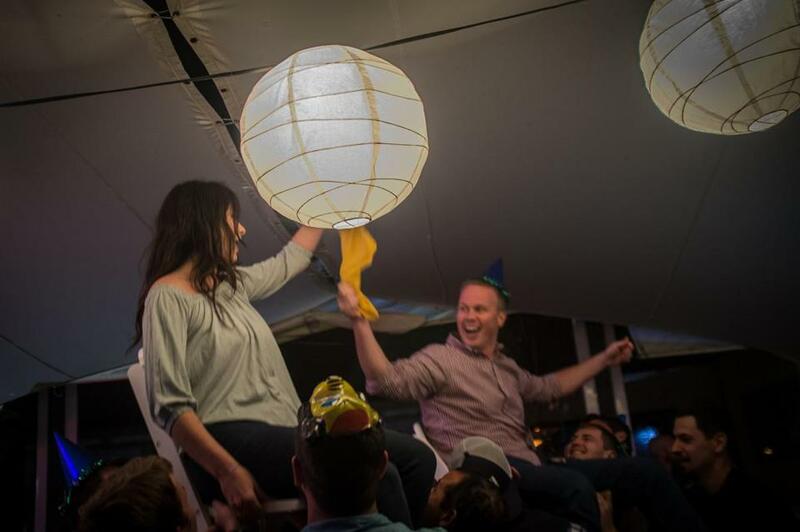 A newly engaged couple is hoisted on chairs during a Horah dance.